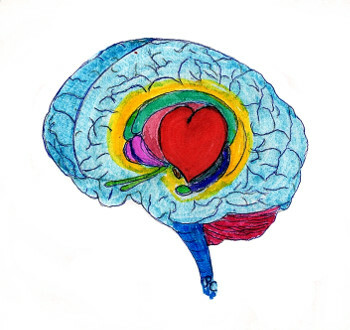 Synopsis: Where your heart resides in your brain and what that has to do with the many emotions triggered by love; how feeding your brain love makes you healthy are all presented and surveyed in this mini-love-lesson; more. First, in cherished tones, you hear the words “I love you”, or perhaps you feel a tender loving touch, or maybe you see a precious sweet smile on the face of a beloved one, or it could be any of the 383 other loving behaviors (so far discovered, Swenson) which can activate your sensory systems to help you experience love. Next, as your nerves are stimulated by a love input they send electrical messages to centers and circuits of your deeper, ancient, non-conscious brain designed for receiving and processing love. That deeper part of your brain primarily is where your psychological heart resides. It is where you process love, being loved and loving. It also is the part of that sends out electrical and chemical messages to other parts of your brain and to many parts of your body activating them to function more healthfully, and generally to beneficially guide you. Then those messages stimulate your brain to make a variety of neurochemical compounds which in turn help to make you conscious of starting to feel the many, various, good, emotional and physical feelings of love. All of that happens mostly quite naturally, automatically and also largely non-consciously at first. But your subconscious knows and is responding. When it comes to love, it seems that the conscious, aware and thinking mind, to a large extent, gets bypassed at first. Some have postulated that perhaps nature does not really trust the conscious mind to handle anything as important as love, other than to be aware of feeling it after it is up and running. Notice, people tend more often to say things like “I realized I love him (or her)”, or “suddenly I just knew I loved (so-and-so)” rather than saying things like “I can tell I love that person a little bit and maybe that love is growing”. That occasionally does happen. Perhaps also that is why you can not feel your love for someone all the time but it is there all the time where you can draw on it when it is called for. You purposely can come to sense love when it exists in you and, thus, know you love someone, but this is just the awareness of love and not the love itself. Because love neurologically is not an emotion but rather a natural, complicated, internal, deep brain process which you sometimes feel or sense. It also is a process which can give you a great many different emotions, among which are feeling loving, feeling loved and feeling lovable. While love happens, you frequently do become consciously aware of the feelings of being loved, and/or loving, or just a sense of love itself. You also may get a wide range of other, accompanying, positive feelings which the experience of love triggers or sets off in your brain. When love is being experienced, there can be accompanying positive feelings of tenderness, intimacy, ecstasy, serenity, passion, emotional closeness and connection, compassion, ebullience, preciousness, empathetic care, oceanic awareness and a great many other fantastic feelings. Identifying love as only an emotion is grossly inaccurate and can lead to mis-judging its emotional richness, nature, power, importance and functional dynamics. In turn, that can lead to a great many missed opportunities, misunderstandings and relational mistakes concerning love. Some of those can be quite tragic. Remember, feeling love is natural but love relating is learned. The whole love process described above can be blocked, confounded and in essence sabotaged by other things that go on both in your brain and in your life. For instance, a former love relationship that was too often or too severely painful can cause you to be extra reluctant and cautious about entering a new love involvement. If you have been trained or subconsciously programmed to be more oriented to one, or more, of the false forms of love you may greatly misinterpret or overlook a current, real love opportunity. Too much emphasis on sexuality, romance, marriage or strong personal insecurity also can get in the way of healthy, real love development. Substance addictions, compulsive avarice and status desires, plus simply plain ignorance about love also provides lots of dangers. These are but some of the many things that can block or interfere with processing love healthfully and doing love-relating successfully. You could skip this section if you are not intrigued about knowing some of the brain/body details of love’s psychoneurophysiology and neurochemistry. There is a lot we don’t know yet and what we do know is like everything else about the brain – complicated. Nevertheless, here is a little bit of more technical brain knowledge concerning what your brain does with love. These knowledge bits can be used to lookup much more complete information than is given here. First of all, the preponderance of research evidence shows love not to be an emotion like it is so often misidentified. Rather, love, at least in part, is seen as a natural, very healthy, systemic, brain process involving many emotions and a whole lot more than that. Brain-wise the process of love is more similar to the biological process of turning food into energy or your body’s systems and for keeping you free from infections than it is to being just a simple emotional feeling. Unlike an emotion, real love is not a temporary, or frequently fleeting feeling. Rather, once real love is established it likely is going to be with you from then on, and some postulate even after death. A relationship may end but if there was real love that will remain even though there might be many contravening variables about other aspects of the relationship. Your psychological heart mostly is in your brain’s limbic system. Love processing involves a good many of your limbic system’s component parts. Thought to be included are your insula, anterior cingulate cortex, caudate nucleus and putamen, all of which show heightened activation when you come in contact with someone you feel love with or for. Lower activation also occurs in the amygdala, posterior cingulate, and the frontal, parietal, and temporal cortices in the right hemisphere of your brain. Those changes in brain activity show love to be at least a twofold process. One, increases good or positive feelings and the other decreases your negative or bad feelings. Among those are a lowered sense of fear and a heightened sense of safety. Changes in the activation rate of those brain parts also mean you become less outer environmentally aware and more internally and emotionally aware as the love process happens. Worry decreases and as love-induced endorphins and dopamine levels increase so does your all-over sense of happiness and well-being. Also thought to be probably involved with the love process in your brain are your hippocampus, parahippocampal gyrus, temporal lobe, orbitofrontal cortex, septal area, corpus callosum, frontal lobe, fornex, mammillary bodies and limbic cortex. Each of those may have to do with different aspects and factors of the love process. When referring to a couple, some may say “they have chemistry” that certainly is true. Love makes a host of neurochemical things happen. Chemical changes in your brain and body frequently include changes in androgen, testosterone, pheromones, serotonin, dopamine, oxytocin, vasopressin, epinephrine, norepinephrine and phenylethylamine, and that is just what researchers have discovered, it seems so far that I know about. Each of those helps you process different aspects of loves dynamics. For instance, oxytocin helps you with feeling love connected and bonded with another. Please note, these are natural, good chemicals that are produced by our bodies when love occurs. So, those who get lots of love in their lives don’t need similar kinds of pharmaceuticals or street drugs with potential toxic side effects. The chemicals your brain makes when it is processing love go into your blood and flow through not only your brain but also through the rest of your body. Everywhere they go they work to have a great variety of beneficial and healthful effects. It seems that each of the three tiers and 12 major categories of loving behavior [see “A Behavioral (Operational) Definition of Love”] may trigger different, healthful benefits. Some are quite invigorating, energizing and mobilizing for action. Others are calming, soothing and make for antidepressant serenity. Quite a few have various kinds of physical healing effects. Others are more healing in a psychological sense. Feeling loved from any source can sort of work like food giving you energy, sometimes a great deal of energy. Feeling serenely loved especially is good for lowering stress and the body’s reactions to stress. Feeling loving toward others brings on one set of physically healthful effects, while acting loving toward others adds another set of physically healthful, biophysical reactions. Getting and giving different behaviors that convey love has a positive effect on your immune system’s functioning, can lower your bad cholesterol and can help your T cells fight cancer. The health benefits go on and on, with research discovering more all the time. Your psychological mind and your psychological heart are in your brain. The brain is in your body and they are all linked together affecting each other. Experiencing healthy, real love works like a vital health food and a rather miraculous medicine. The more you interact with people you love, and are loved by the more your brain produces helpful responses that affect your entire body’s health. This also seems true for those you like and those you are liked by. More love equals more health. That is what more and more research is showing. The more you are absent from healthy, real love input, the more you are psycho-physically malnourished or even starved and the more likely you are to have a physical and/or psychological health malfunction. Mixing a lot with people doing false love is like eating non-nourishing, junk food. Even worse, is to be around and interact with negative, anti-love acting people. That is akin to eating toxic and poisonous food. Also bad for your health is a lack of healthy self-love, and self-hate and self negation are even worse. If at your work, or somewhere else you spend time, involves a lot of contact with non-loving, false love or anti-loving people, you had best counterbalance that with healthy self-love and with others who love well. Remember, it is very important to “love others as you love yourself”. It is likely your health depends on it! How about sharing and talking over this mini-love-lesson with a friend or two and, thus, spread some love knowledge into our rather love ignorant world. 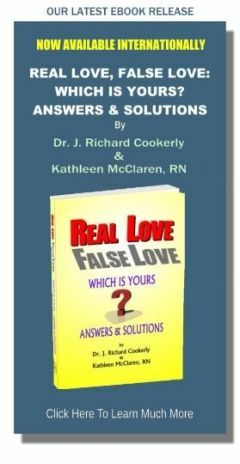 ♥ Love Success Question: How much real healthy love, shown physically and psychologically, have you been feeding your brain lately?